Our growing customer base treats LabsAdvisor as their one stop solution to all diagnostic needs. Pathology, radiology or high end diagnostic services can be booked through our online portal or through our customer service helpline. Through its diagnostic partners, LabsAdvisor offers the largest repertoire of diagnostic tests in the country. 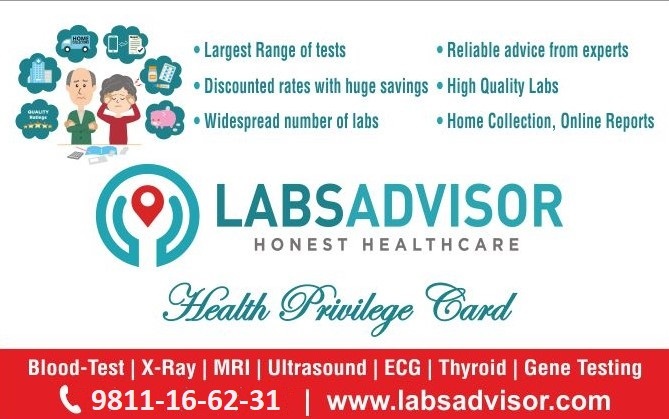 We are now delighted to bring LabsAdvisor Health card to our customers to make their diagnostic experience even better. By opting for LabsAdvisor Health Card, you can become eligible for an array of savings which are over and above those enjoyed by our regular customers. Value of ₹ 350 immediately - Two ₹ 100 vouchers and one ₹ 150 voucher is given. These can be used for any booking with LabsAdvisor. 5% cash back on any booking done though us - this is in addition to the great discounts that you will already receive like anyone else. The cash back offer is not only limited to you - you can book tests or health packages for any member of your family, any friend and even neighbours, and the card holder will get the cash back on those bookings as well. Value of ₹ 1,500 immediately - Five ₹ 100 vouchers and five ₹ 200 vouchers are given. These can be used for any booking with LabsAdvisor. The cash back offer is not only limited to you - you can book tests or health packages for anyone - same as for ₹ 349 card. For both the cards, in addition to the above benefits that you derive immediately, do expect many more advantages in the near future. We are expanding our footprint as we speak and soon you will have savings on your other healthcare needs as well. Welcome to a world of benefits with LabsAdvisor Health Card. One voucher can be used for one booking only. This booking can be in the name of the account holder or anyone else. During the booking, the name of the card holder as well as the Health Card number will be required. The cash back on the bookings will be credited to the account of the card holder. Once, the amount exceeds ₹ 50, it cab used against any booking fully or partially. The cash back can be used in the denominations of ₹ 50 only.